To fulfill the requirements of BBA program under International Islamic University Chittagong (Dhaka Campus), we have prepared this report on BASIC Bank Limited (Uttara Branch) and their modern banking operation with foreign exchange procedure where I have worked from September 2008. The main objective of the study is to highlight on the major documents used by BASIC Bank Ltd. While dealings with foreign exchange banking. 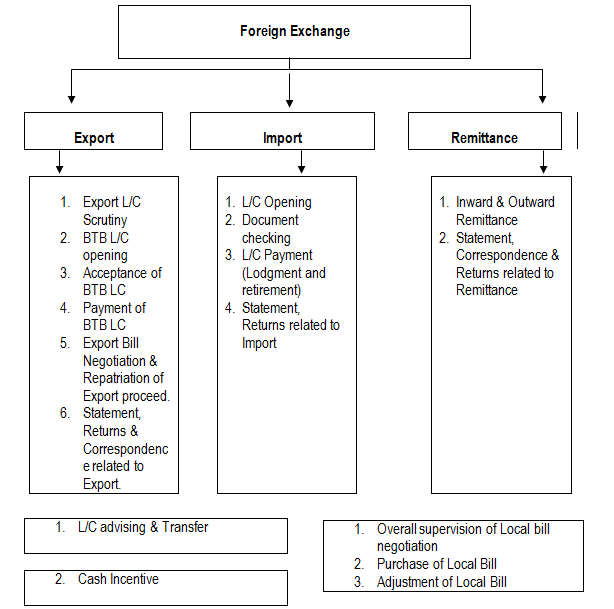 To identify the documents used in foreign trade of BASIC Bank Ltd.
To appraise export, import & remittance of the same bank. To identify problems of foreign exchange banking of the selected bank. To suggest suggestions for improvement of foreign banking of the given bank. Ø Observing various organizational procedures. We have covered both head office and UTTARA branch of BASIC Bank. But the body of the report is prepared in the light of the branch. Only International Department (ID) part is covered in the Head Office. Learning & gathering experience of all the banking functions was really tough. Another limitation of this report is Bank’s policy is not disclosing some data and information for obvious reason, which could be very much useful. Large-scale research was not possible due to time constraints. BASIC Bank Limited (Bangladesh Small Industries and Commerce Bank Limited) registered under the Companies Act 1913 on the 2nd of August 1988, started its operations from the 21st of January 1989. It is governed by the Banking Companies Act 1991. The Bank was established as the policy makers of the country felt the urgency for a bank in the private sector for financing small scale Industries (SSIs). At the outset, the Bank started as a joint venture enterprise of the BCC Foundation with 70 percent shares and the Government of Bangladesh (GOB) with the remaining 30 percent shares. The BCC Foundation being nonfunctional following the closure of the BCCI, the Government of Bangladesh took over 100 percent ownership of the bank on 4th June 1992. Thus the Bank is state-owned. However, the Bank is not nationalized; it operates like a private bank as before. BASIC Bank Limited is unique in its objectives. It is a blend of development and commercial banks. The Memorandum and Articles of Association of the Bank stipulate that 50 percent of loan able funds shall be invested in small and cottage industries sector. Paid up capital : Tk. 945 million. The Bank is required to transfer 20 percent of its net profit before Tax to Capital Fund as per the Banking Companies Act 1991.
b. Full-fledged commercial banking service including collection of deposit, short term trade finance, working capital finance in processing and manufacturing units and financing and facilitating international trade. c. Technical support to Small Scale Industries (SSls) in order to enable them to run their enterprises successfully. d. Micro credit to the urban poor through linkage with Non- Government Organizations (NGOs) with a view to facilitating their access to the formal financial market for the mobilization of resources. In order to perform the above tasks, BASIC Bank works closely with its clients, the regulatory authorities, the shareholders (GOB), banks and other financial institutions. As stated earlier the Government holds 100 percent ownership of the Bank. All the Directors of the Board are appointed by the Government of Bangladesh. The secretary of the Ministry of Industries is the Chairman of the Bank. Other Directors of the Bank are senior Government and central Bank executives. The Managing Director is an ex-officio member of the Board of Directors. There are at present 7 Directors including the Managing Director. The management is headed by the Managing Director. He is assisted by the Deputy Managing Director, General Managers and Departmental Heads in the Head Office. BASIC Bank is different in respect of hierarchical structure from other banks in that it is much more vertically integrated as far as reporting to the Chief Executive is concerned. The Branch Managers of the Bank report direct to the Managing Director and, for functional purposes, to the Heads of Departments. Consequently, quick decision making in disposal of cases is ensured. BASIC Bank’s services are directed towards the entrepreneurs in the small industries sector. A small industry, as per Industrial policy 1999 approved by the Cabinet, has been defined as an industrial undertaking whose total fixed investment is less than Tk.100 million. The industrial loan reflected a significant growth of 22.59 percent over the previous year. Total outstanding industrial loans including term and working capital stood at Taka 12,243.56 million at the end of 2006 compared to Taka 9,987.50 million of 2005. Total outstanding term loan stood at Taka 3,897.12 million as on December 31, 2006 compared to Taka 3,517.85 million in 2005 reflecting a growth of 10.78 percent. The outstanding working capital finance extended to industrial units stood at Taka 8,346.44 million at the end of the reporting period compared to Taka 6,479.71 million in 2005. Growth rate here was 29.00 percent. BASIC Bank’s services are specially directed towards promotion and development of small industries. Its exposure to small and medium industries sector accounted for 53.43 percent of the total loans and advances. During the year total of 159 projects were sanctioned term loan. Out of which 89 were new and the rest were under BMRE of the existing projects. As on 31 December, 647 projects were in the portfolio of the bank. The textile sector including garments being one of the major contributors to national economy dominated the loan portfolio of the Bank. Other sectors financed include engineering; food and allied industries; chemicals, pharmaceuticals and allied industries; paper, board, printing and packaging; glass; ceramic; and other non-metallic goods and jute products. Recovery rate of project loan was 89 percent. The Bank also supports development of trade, business and other commercial activities in the country. It covers the full range of services to the exporters and importers extending various facilities such as cash credit, export cash credit, packing credit, short term loans, local and foreign bills purchase facilities. As on December31, 2006 total outstanding commercial loans stood at Taka 6,397.21 million Compared to Taka 5,013.55 million in 2005. BASIC Bank launched a Micro Credit Scheme in 1994. Micro Credit Scheme provides for the poor for generation of employment and income on a sustainable basis particularly in urban and suburban areas. The Bank follows three systems of credit delivery. 1. Lending to the NGOs who on-lend to their members. At present there are 15 such NGOs. 2. Lending direct to the targets groups or ultimate borrowers under the Bank’s own management. 3. Lending direct to the member-borrowers and NGOs providing nonfinancial services like group formation and monitoring and supervision on exchange for a supervision fee. At the end of 2006, total amount of Taka 359.24 million remained outstanding as against Taka 338.30 million in 2005. Recovery rate during this period remained at a satisfactory level of 100.00 percent. The bank achieved substantial growth in export in 2006 and the performance of the bank in import business was also satisfactory. The Bank handled total export business of Taka 15,463.74 million and import business of Taka 17,804.27 million in 2005. The export and import business grew by 39.34 percent and 26.32 percent respectively. Major items of exports were garments, jute products, textile, leather etc. Items of import included mainly industrial raw materials, garments accessories, capital machinery, food items and other essential commodities. The Bank became a proud member of SWIFT (Society for Worldwide Interbank Financial Telecommunication) that would pave the way to achieving uninterrupted communication related to banking for international trade business and fund transfer. The Bank provides services for remittance, underwriting, guarantee, public offering of shares etc. The bank also provides funds to investment and leasing companies. The Bank has recently created a venture capital fund for equity support to innovative but risky projects. 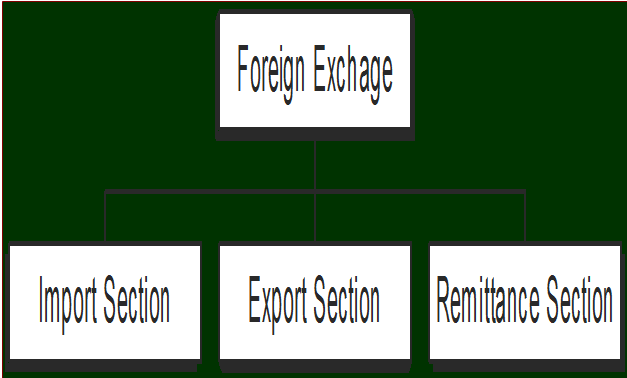 Foreign Exchange means foreign currency and it includes any instrument drawn, accepted, made or issued under clause (13), Article 16 of the Bangladesh Bank Order, 1972. All deposits, credits and balances payable in any foreign currency and draft, travelers cheque, letter of credit and bill of exchange expressed or drawn in Bangladeshi currency but payable in any foreign currencies.